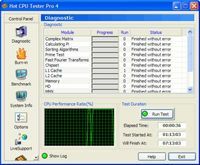 Hot CPU Tester Pro is a system health and stability tester. It tests CPU, chipset and virtually all parts of motherboard for errors/bugs, defective parts and components. It is a burn-in test with uniquely designed state of the art DefectTrack engine. DefectTech is a technology developed by 7Byte to diagnose systems regarding its stability and in general, computer's health. Hot CPU Tester is currently being used in many labs and governmental organizations around the world, as a reliable stability testing utility. New features: -Revolutionary DefectTrack 2.0 engine, accurately tests the whole system and its subsets. -Written purely to test CPU, chipset, motherboard, Memory -Fully supports AMD64 computing platform(AMD Ahtlon? 64 and AMD Opteron? 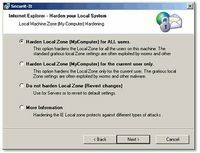 processors) -Fuly supports multi-processor systems -Fully supports Hyper-Threaded processors -Utilizes SSE, SSE2, MMX & 3DNow! instructions sets -Tests L1 & L2 Cache -Tests System Bus & Memory Bus -Tests Chipset along with motherboard -Tests Harddrives -Monitors CPU performance under pressure -Built in Anti-Crash & Exception Handler -Comprehensive Benchmark tests -SMBIOS & CPUID featured -LiveSupport How it works: Hot CPU Tester Pro 4 consists of several test modules to stress-test each component within a system. Defective parts are most likely for to fail while they are under a heavy load, when the heat production is at its highest. The testing modules intentionally stress all components to their maximum limits to assess their integrity. Unstable parts cannot endure these pressures and will fail the tests, allowing the opportunity for an upgrade or exchange before the PC is released into a production environment. 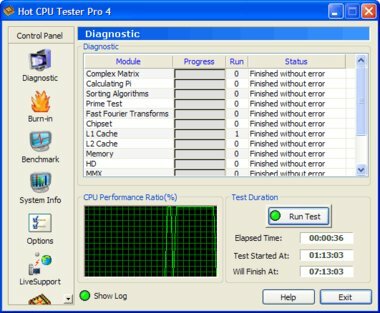 It is recommended that Hot CPU Tester should run for at least six hours to fully check the system. If a system is stable under hard conditions for six hours, it is unlikely to generate errors during normal operating conditions.